This morning we walked up Moel Dduallt, which is dwarfed by Moelwyn Bach. Moel means hill, sometimes a ‘bare’ or ‘bald’ hill, thus Moelwyn Bach translates to the Little White Hill; but ‘hill’ just doesn’t do justice to the craggy cliffs in front of that 710m peak. 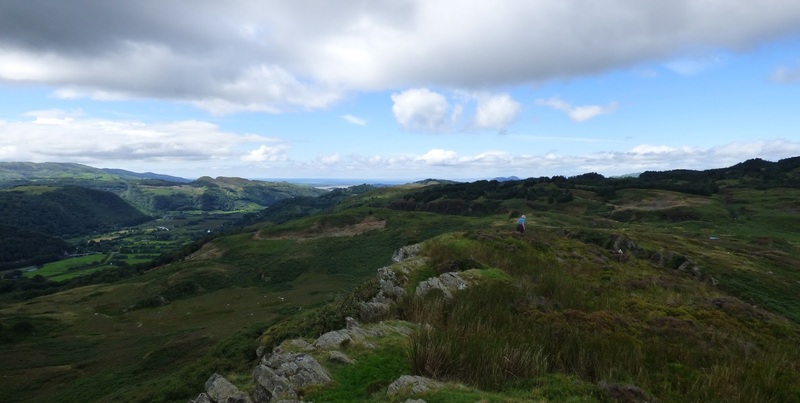 As for Dduallt, that translates to Black Hill or Black Hillside; so does Moel Dduallt mean the (bare) Hill on the Black Hillside? Doesn’t seem to fit with Moelwyn being the White Hill. It's also far from 'bare' with lots of trees on the south side, albeit the oaks are a bit bonsai, particularly those in the firing line of the south westerly winds. 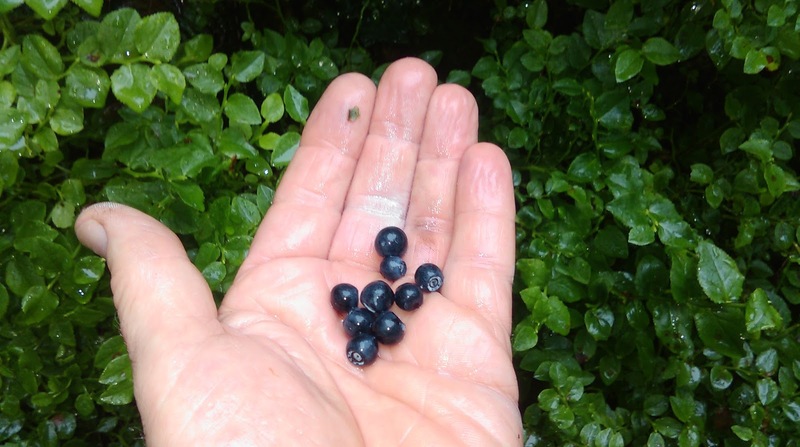 Maybe the ‘black’ comes from the profusion of ripe bilberries. We picked enough to turn our breakfast cereals purple for the next few days. Whatever the meaning of the names it was a beautiful walk with stunning views. It's been a tough summer for the sheep; wet fleeces, and still no date for the shearing. Farmers are running late. You can't gather sheep off the mountain when the clouds are down. But they seem in good spirits, as if at Glastonbury. 'If you're going ..... to San .... fran....cisco. On a positive note, and possibly connected with the above average precipitation, there is a bumper crop of bilberries. Yum! The first episode of this new 6 part series will be on BBC2 at 8pm on Thursday 21st 'EXCEPT WALES'. 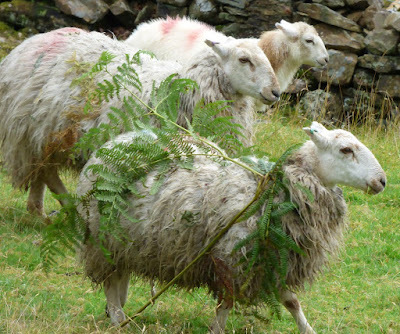 Sometimes these regional variations can be very frustrating, so we will be watching a little later on the iPlayer. 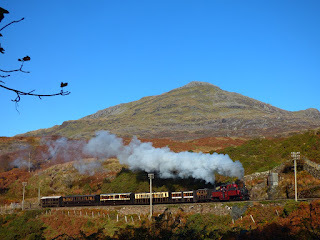 The TV crew were filming on the Ffestiniog and at Llechwedd for 3 days in mid February with lots of rain. Here's the intro to the series. Historians Ruth Goodman, Alex Langlands and Peter Ginn bring back to life the golden age of steam and explore how the Victorian railways created modern Britain. The introduction of steam railways in the early 19th century changed Britain in a way no one could have predicted. This episode explores how they created a domestic revolution, changing the way we lived, from the houses we lived in to the food we ate. Just a nice photo - nothing to do with the TV! 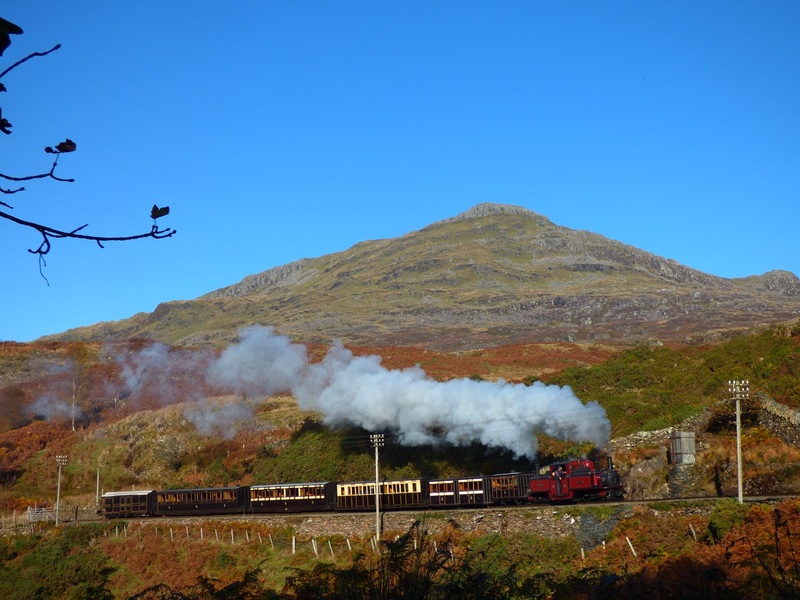 In the middle of winter and the team arrive at the Ffestiniog Railway in Snowdonia to find out how millions of tons of slate were moved down the mountain. This is the slate that covers roofs in every corner of the country and all of it was moved by rail. Underground, Alex experiences the brutal conditions faced by miners in Llechwedd quarry who would have endured 12-hour shifts suspended from iron chains. It's an exhilarating ride down the narrow winding track aboard the 'gravity train' with the whole crew hanging on to the brakes all the way. For more details of the series click here.